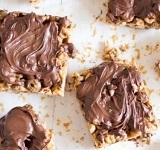 Chocolate Peanut Butter Bars are a delicious after-school snack. 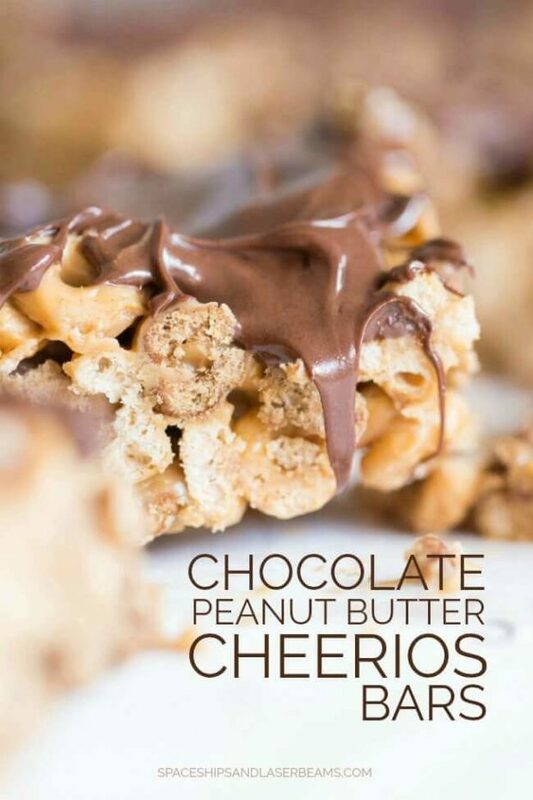 These chocolate peanut butter cereal bars have become a fast favorite at our house. At often requested after school snack in fact! Both of my boys are in school this year. Should I feel guilty that I don’t feel sad? Nah. Waste of energy. I know they’re having great times at school and I now have time to think an entire paragraph without being interrupted three times. 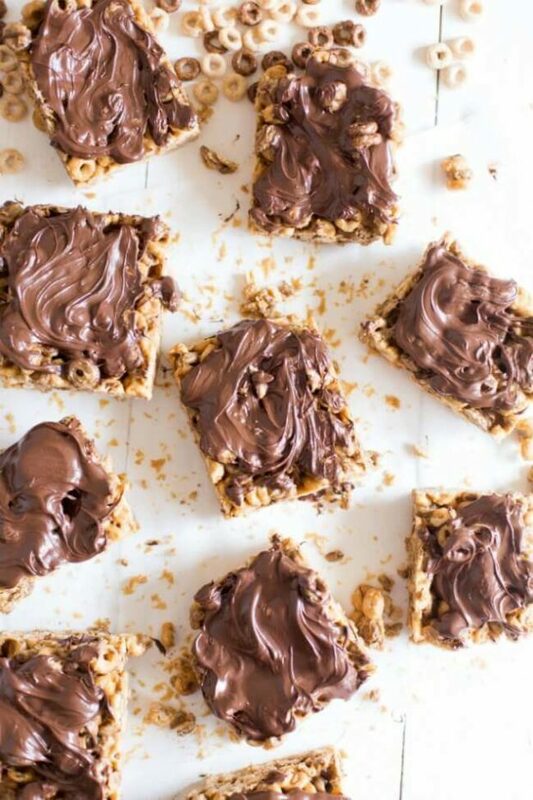 When the boys get home, we’re all ready to have fun together and I make a point of doing a little something special with them, like making these Chocolate Peanut Butter Bars. Thanks for helping me make smile, Cheerios, and thanks for sponsoring this post. School just started a couple of weeks ago but we’re already getting into a comfortable routine. 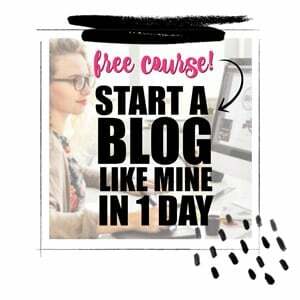 I think getting them out the door on time is the biggest challenge but even that is easier already. When I get the next day’s details ready the night before, mornings are a lot less frustrating. The second greatest challenge is when they come home from school. They’re both hungry and a little tired when they get home. NO, Momma MUST hear details! 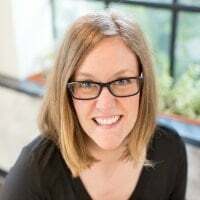 I taught elementary school before I became Momma and I know there’s a lot going on at school. So, I decided making after-school snacks together would be our thing. They’re more talkative when we are working on a project—especially if it’s a recipe that means good snacking! These easy, homemade bars are no bake… making them a great recipe to do together. Sliced into squares once they’re cooled, everyone enjoys noshing on their own as we chat. I think you’ll agree this chocolate and peanut butter recipes is one of the best ways to enjoy two of our favorite ingredients together. The Cheerios give them a satisfying crunch as well. 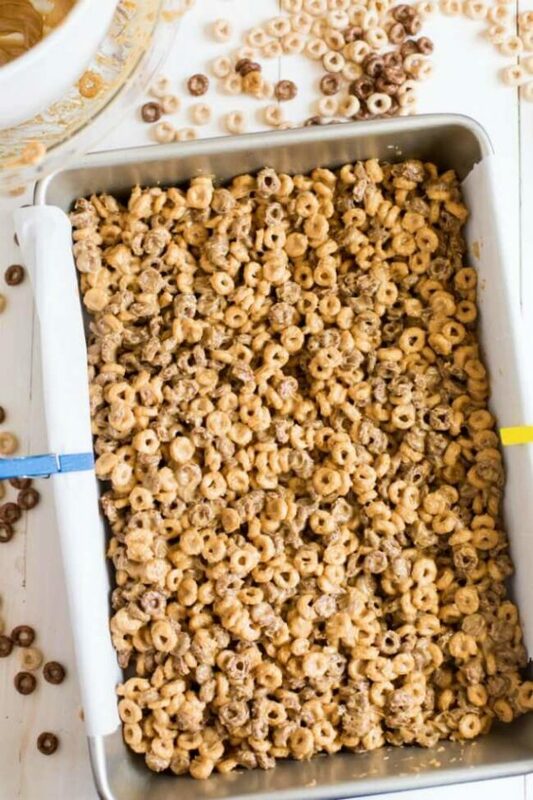 Cereal bars are easy to love! You only need five simple ingredients to make this deliciousness happen! 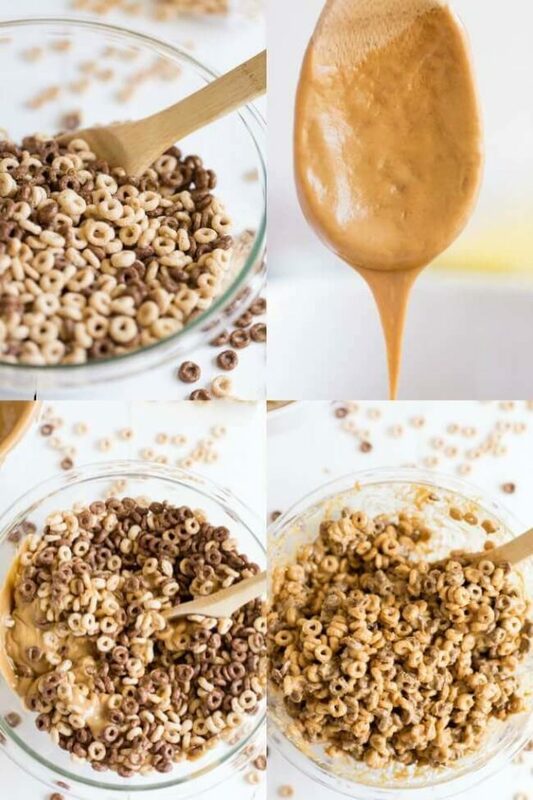 Grab creamy peanut butter, honey, original Cheerios, chocolate Cheerios and semi-sweet chocolate chips. You could also add things like flaked coconut, mini marshmallows or sprinkles on top too if you wanted. Both boys are used to my kitchen experiments and food photography, and they like “helping”. These bars are perfect for small helpers because they can pour and stir—their favorite parts, next to tasting. Although I always expect a few handfuls of Cheerios will disappear and there will be bowl licking, I don’t mind. 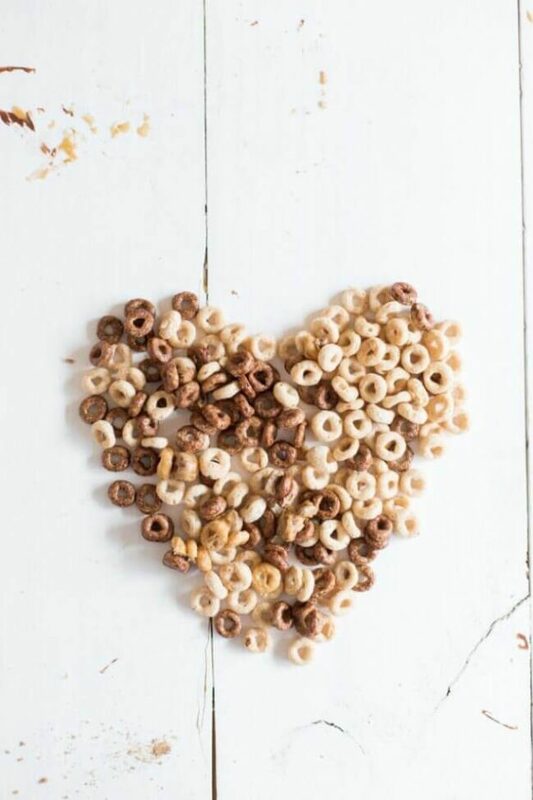 Cheerios is made with whole grain oats, no artificial flavors or colors, and they’re heart healthy—all things I feel good about. In microwave safe bowl, melt peanut butter and honey for 1 minute. Stir to mix well. In large bowl, pour in cereal. Pour half of the peanut butter and honey over the Cheerios and gently fold to mix. Pour remaining peanut butter and honey into the bowl and gently mix until all Cheerios are covered. Line a 9×13 pan with parchment paper and pour mix into pan. Place in fridge for 1 hour until completely chilled. In a microwave safe bowl, melt chocolate chips, microwaving in 30 second bursts. When bars are chilled, remove from pan; cut into 12 squares. Spoon melted chocolate onto each bar; spread an even layer over the bars. Return to fridge to chill. A glass of cold milk is the beverage of choice for my guys! I’ve also offered them some fresh sliced strawberries with the bars and it was the perfect flavor combo. These bars are best after they’ve chilled so noshing while they’re waiting for the finished product keeps ‘em happy. And it just gives us a little more time for goofing together. If you have leftovers, I would suggest storing them in the fridge. After all, I don’t feel sad my guys are both in school this year…but I am very glad when they get home. At the end of the day, I don’t even mind being interrupted. 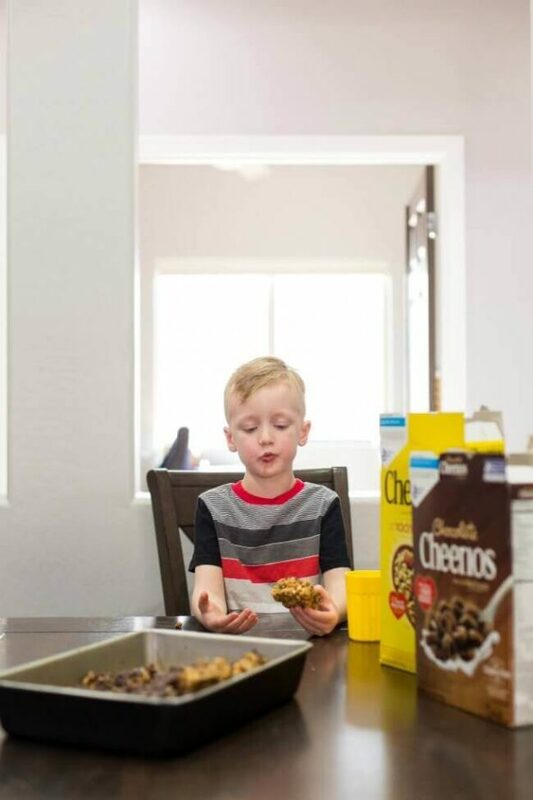 This easy recipe features chocolate, peanut butter and the crunch of cereal for a winning snack idea! What a wonderful recipe! I love it!